It’s been a while since I’ve posted. I’m still writing every day – which is far ahead of where I was a couple months ago. I’m starting to realize more and more how hard it is to make it in this business. There is so much competition, yet at the same time, you can’t focus on the competition and you just have to concentrate on your own stories and make them the best they can possibly be. For someone like me, who’s in the learning stage, I’m going to make mistakes still. This might sound strange to say, but thankfully my ego is just big enough to still think I have a shot of being noticed. I still know I do, and I’m glad for that. I think I’m getting better, little by little. KDP (Kindle Direct Publishing) is a good training ground. It’s also good because there’s a chance you can make money there. I say “chance” because writing is never a sure thing. There is a strange mix, in varying degrees, of skill, work, and luck. I can’t control how many people buy my books, but I can control how much I write. I can control my skill and my work by writing every day, and as they say, luck favors the prepared. I’m hoping to do be done with book two by March, and I think I can make that goal. I hope to take a hearty bite out of it this weekend, and for the most part it seems to be writing itself. Writing is a slow game, and I think working a job inspires me to keep trying, even if I wish I had more time to do what I love. When someone tells me they like my book, or if someone I don’t know reviews it on Amazon and says it goods, it makes it all worth it, in a way. I think Apocalypse might be the best thing I’ve written, not in the sense that it’s amazing, but it is decent. It is good enough. There are some mistakes in there that I would change in the future – the beginning is a bit slow, the ending a bit rushed, some people die off without getting due resolution (which happens in real life, but not often in fiction life). 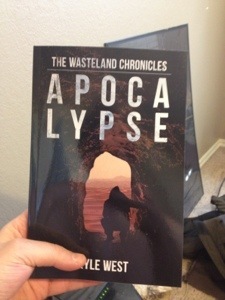 One reviewer said it was dark, but I guess that’s what you get when it’s an apocalypse. That’s kind of what I was going for, anyway. I wanted my main character, Alex, to be reduced to nothing but the clothes on his back, and I think I accomplished that. All the same, Apocalypse is the best-plotted thing I’ve written, and it has an interesting world. The characters didn’t develop as much as I would have liked them to, but they were developed enough for the purposes of the story. Things are getting a little more tense in book two (I might post some text from it later). I think Origins will be better than Apocalypse. It has a darker vibe to it, if that even makes sense. In it, the darkness and senseless pain of the world will be made all the more apparent, and Alex will have to deal with it. It will also foreshadow books three and four (yes, there will be four now), where the game will change completely. Everything is just going to get bigger and bigger, until the final showdown at the end. One of my weaknesses as a writer is character development. I don’t know if this is something that other writers struggle with, but it has been one for me. I’m getting better, though. The characters in Apocalypse are more fleshed out than in previous books I’ve written, and I’m trying to find that happy balance between action and getting to know the characters. But sometimes, one of the things I miss out on is character development through action. When I write, I don’t really think in terms of “what can I do to develop this character?” It’s more organic for me. It’s more like, a situation arises, or one character does something to another one, and I think, “What would my character do, given this situation?” It’s like I’m stepping in that character’s shoes for a moment, taking on all who they are, and going from there. In a sense, I am all of my characters. After all, I created them. They exist in my head, and in the head of anyone who reads about them. If there’s anything I’ve learned about people in general it’s that they are complicated. In the end, they are out for themselves. Each one thinks they are the main character of their own drama. A story is not all about the main character, although the book itself might be centered around him, or her. Characters do not willingly give up power to each other. They have their own agendas and goals, and only help the main character if their goals line up with his or hers. No character is perfect, either. They have bad as well as good. Thinking of the book I’m writing on, Alex, the main character is innocent and good – but these are also his weaknesses, and without his friends, he wouldn’t survive long. Makara is tough, but she is also harsh. She does not trust easily, or at all, and she doesn’t want to consider the deep questions. She is a woman of action, who as long as she has a singular goal she can fight toward, she can forget everything else. Samuel is idealistic, strong, and a natural leader. He can also be blind to the needs of others as he focuses on getting the main mission done. Of all the characters, Samuel is so far the least realized because he has had so little page time – though he will play a big part in book two. And there are other characters as well coming on the stage – and seeing them interact with their own goals, motivations, and selfish ambitions has turned his apocalypse team into a powder keg, with its own internal conflicts to deal with if they are ever to complete their mission. They have a long way to go, however, and they haven’t even gotten started on their journey yet! I just passed ten thousand words this morning, realizing that characters are the reason we read books – not genre, a cool cover, or whatever. These things help, but when it gets down to it, we are just addicted to story – and you don’t have a story unless you have at least one character that wants something, and something else that prevents them from getting it. Characters are always the movers of plot. There might be something outside their control that influences the plot (like the weather, or a random death, or some other catastrophe (or perhaps something not so catastrophic)), but in the end, it’s the character’s decision that causes the story to move forward toward its resolution – and sometimes the resolution is the non-resolution. Anyway, that’s my rant on characters for now. I’ve run out of time to write, but I will probably revisit the topic later. I have zero motivation to do anything today. Nothing. I just want to veg out and watch TV. I already looked over the proof of Apocalypse, found way more typos than I thought the book had, which shook my confidence. I am definitely, definitely hiring a copyeditor for my next book. Where does my lack of motivation come from? I think it comes from knowing that the novella I finished a couple week ago (that still does not have a title) will need a lot of work if I’m to release it. Just thinking of all that drudgery keeps me from doing it. It’s at a point where I feel like the entire thing needs a rewrite. I’m not sure if I even believe in it. Maybe it’s just the lack of coffee this morning. I started writing a bit of Origins yesterday – I may just switch efforts to that for a while. Or it could just be the fact that I’m becoming a bit burned out. I don’t know. Maybe I’ll try to get something to eat and drink some coffee and just force myself to do it. Sometimes, that’s what it takes. So, how am I actually doing…. I know people are curious, and it seems when I post these crazy numbers on Facebook, it might seem like I’m taking off. I don’t believe I’m going to “take off,” although I do believe if I keep at it, keep writing quality books, and keep promoting, I’ll experience a gradual climb as a result of hard work. That’s what I’ve done. I’ve worked really hard on my writing in the past couple months. I’m starting to see the first results now, and I’m starting to re-preoritize finishing new projects rather than promoting the ones I already have. So that leads to the question – am I really a gazillionaire? No. I work in a warehouse, so I definitely don’t think I’m a gazillionaire. Although I’m making more than I did before, I still have yet to see my first royalty payment. That comes at the end of February (for the month of December…a writer is always paid, but always late), and I won’t see any royalty for January until the end of March…and by that time, Origins will be out, and hopefully my fantasy novella will as well. So this month, without counting the free promotion I did, I had 119 downloads on Apocalypse. My thoughts: that’s over twice as many as I had last month. At this time two weeks ago, I had less than thirty sales in January and three reviews (Now, there’s eight reviews and hopefully more are coming). That’s pretty cool. What’s cool about some of these reviews is that I believe they are from people I don’t know, and they are generally rating the book 4-5 stars. Which is awesome. How much money is that, exactly? Probably about $236, minus taxes. Nothing to sneeze at, but I’m not quitting my job any time soon. If I had several other books, maybe. Despite what you see in the news, runaway bestsellers (one-hit-wonders, if you will) are actually pretty rare. That’s why they make the news, because they are the exceptions. I’m telling myself not to check my sales page as often as I do, but I keep coming back to it. I need to at least have a few more books out there. In fact, I should be writing now instead of writing here. But still, I’ve never had that many downloads in a month. Ever. It’s really cool and I hope it lasts. The reason is clearly because of the two day free promo. Maybe they don’t work for everyone, but it seemed to work for me. It’s almost two weeks later and I’m still seeing a boost. All I know is I’ve had 80ish downloads in the past two weeks. Currently, I’m holding off the promotion (though when the paperback copy is ready to go for Apocalypse, I plan on doing giveaways on Goodreads). Right now, I have to finish my sequel, Origins, my fantasy, and my romance. Yes, I said romance. I don’t know if I’ll actually finish that one, but we’ll see. It’s been interesting to write, and something out of my normal purview. It came five days earlier than I expected. For the most part I am very pleased with it. I don’t know what it is about print, but it is so much easier to find typos. I’ve read this book I’ve read at least a dozen times or more and it still has typos. This has given me a lot more respect for copy editors as well as the humility to outsource that task in the future. I’m definitely not good at the tiny details. It is very cool to hold my book in my hands. I can’t wait until the corrections are made and I can start promoting it some more. 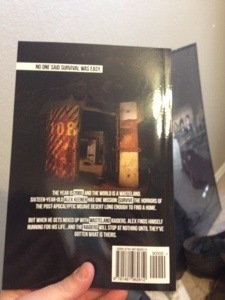 By the way on the second picture it looks like my Radiohead poster is part of the book. It is an illusion! Pictures aren’t the greatest, I know, but I’m too lazy to retake them. Also, reading a physical copy makes me realize that the book does start out a little slow. But something happens around page fifty that made even me, someone who’s read this story countless times, want to read on. This was from entering the “first door’. I might blog about “the first door” later.